Use the tool point of connection to connect a tool to the one-line. A tool is a piece of equipment that can potentially have multiple different points of connection to the electrical system. The point of connection represents the combination of both a bus and a load. This combination enables you to perform arc flash calculations on the bus and load as a unit. Tool ID The identifier for the tool. You can select from the list, or click Tools to create a new tool. See Edit Tools for more information. The reference number for the point of connection. This information appears on the one-line. Base kV for the tool point of connection. Note that the tool point of connection must have a kV entered before equipment can be connected to it. Anything less than 1 kV is considered low voltage, anything 1 kV or more is high voltage. Tool Type This represents a type of tool. Facility The facility where the tool point of connection exists. This information comes from the tool. See Edit Tools for more information. Facilities are set up under Tools > Options > Facilities. Func. Area The functional area where the tool point of connection exists. This information comes from the tool. See Edit Tools for more information. Bay The bay where the tool point of connection exists. This information comes from the tool. See Edit Tools for more information. Lock Auto-Sizing When this check box is selected, the tool point of connection cannot be auto-sized. Bracing (kA) Short circuit rating of bus bracing in kA. Description Description for the bus. Fed By Use this field to indicate the transformer or the power supply source feeding the bus. Unit The unit for the point of connection. Select from CSA, metric, or U.S.
Library Load Text to describe the library load for the point of connection. 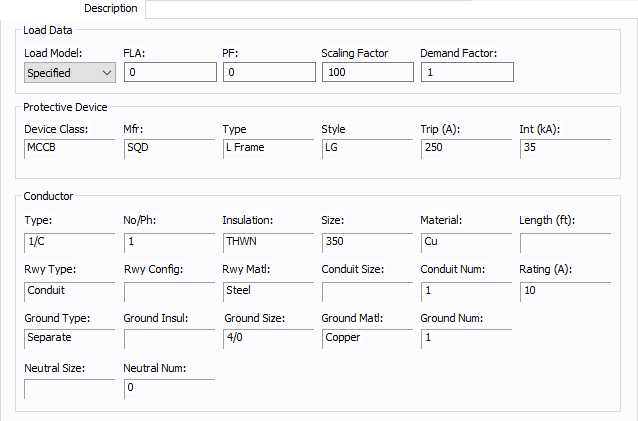 Load Model Select from Specified (user-entered) data or from SCADA (Supervisory Control and Data Acquisition) data. 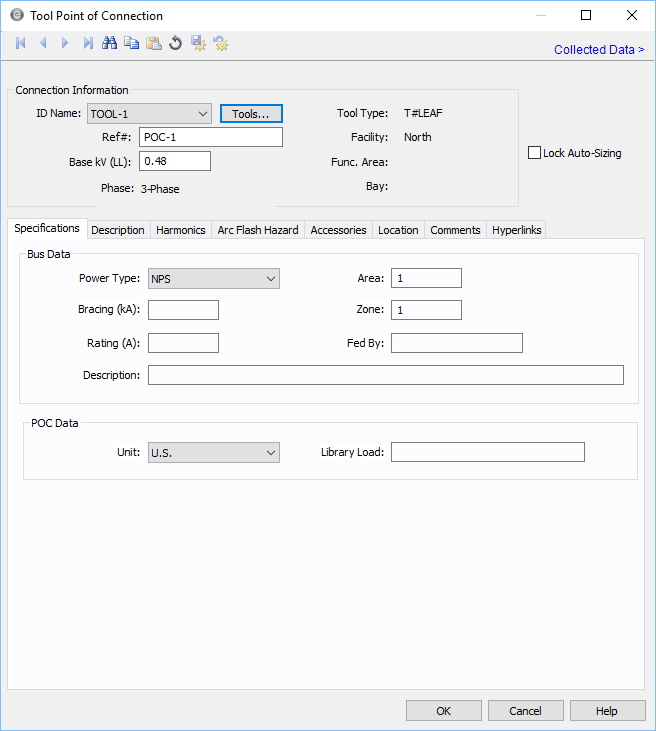 SCADA data can be imported by clicking File > Import. 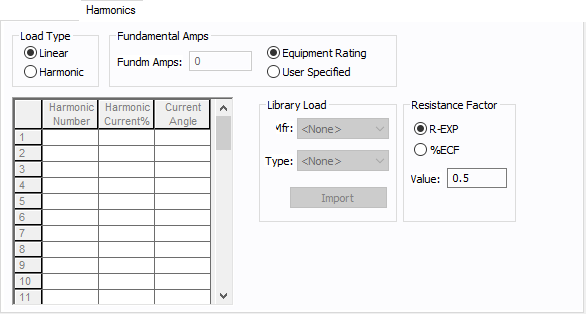 FLA Full load amps (rated continuous current) of the load. The point of connection load is treated as a constant kVA load model when performing power flow calculations. PF Power factor for the load. The protective device information comes from the breaker located between the point of connection and the bus. The conductor information comes from the cable that joins the point of connection with the bus.